Jason Woodside is one of several street art artists commissioned by real estate firm JBG in Washington D.C. in 2015 to bring color to the city. Whether it be office buildings, loading docks, apartments or vacant buildings - the artists have the task of filling the gray walls of the city with life. More than two dozen Murals were commissioned in the neighborhoods where the real estate giant owns most of its buildings. 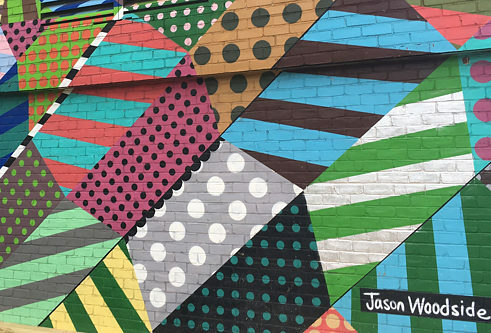 While many Washingtonians may still debate whether the project was in fact promotion for JBG or actually contributed to the beautification of the city, nonetheless the artists were given a free hand in the design of their walls and so Jason Woodside was able to perpetuate his unmistakable style with its bright colors and wild pattern mixes of dots and stripes in Washington. For the young artist, murals are only one of many ways to present his art. As a graduate of New York's School of Visual Arts, he has become one of the big names in the visual arts scene and has worked with well-known companies such as Adidas and Obey Clothing in fashion design. The diversity of his work is also reflected in the fact that he has opened a café in New York City with friends, selling – besides coffee of course – works by local artists, clothing, books and much more. A life as colorful as his art.